Faaborg, or Fåborg, is a charming old fishing port on the Faaborg Fjord in Fyn, Funen (which is an island). The port is still busy, and the wonderful, colourful old houses, mostly dating from the 17th century, Faaborg’s heyday, and arranged in a traditional way around narrow streets, makes this a popular spot for visitors, so it’s a pretty bustling place to be. Many of the best places to stay in Faaborg can be found on the waterfront, but if you’re visiting the island to relax or escape, then you might want to try one of our Guru’s slightly-out-of town recommendations for the best places to stay in Faaborg. 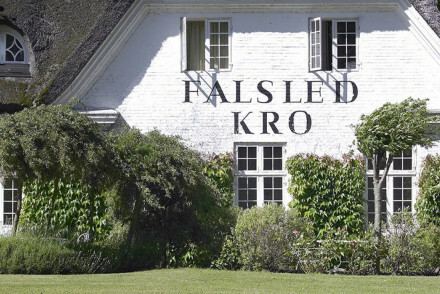 Falsled Kro is a beautiful, thatched-roofed, old inn set amongst the superb scenery of Southern Fyn. There are 19 good sized rooms with peaceful views, plus a Michelin starred restaurant which spills out into the garden with weather permits. And a garden which leads all the way down to its own sandy beach. Still not sure which is the best place to stay in Faaborg for you? Browse through our list of all the best places to stay in Faaborg, or contact one of our friendly Gurus for advice. The gourmet Lover’s Inn set in idyllic surroundings in Southern Fyn. Good size rooms with beautiful views of the Inn’s restaurant garden, leading down to its own sandy beaches. Minimalist rooms in creams and whites with terraces for the views. Michelin starred cuisine and beer brewed on site!